Ce Acatl Topiltzin Quetzalcoatl, usually only Quetzalcoatl, (* 843 ) was a priest-king of the Toltecs. His name means " one pipe, Our dear Prince, glowing tail feather serpent ". His life data have been handed down contradictory. After the strong adhesive applied over-molded reports from the colonial period he reigned in Tollan, where he is said to have introduced the arts and sciences, in particular writing and calendar. 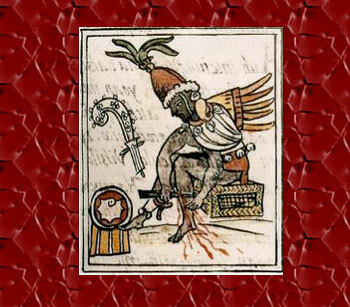 The Aztecs derived their rulers from over the kings of Colhuacan from him. According to recent studies, presents his life story, so far as it is to reconstruct from the sources, as follows: He was born in 843, and was from 873 King of Tollan. Its end is not transmitted clearly: either he died in the year 883 or 895, he left with his followers the city and reached after a long hike the coast of the Gulf of Mexico. Have, where he is said to have either burned himself and his went up to the morning star, or on a raft formed of snakes over the sea to the land Tlillan Tlapallan ( land of blackness and redness ) issued. This country is equated by many researchers to the field of Mayan culture. His reign is described ( from the perspective of the Christian Indian writers of the colonial period ) were peaceful and wise, the cruel sacrifice averse practices, similar to himself as a hermit. 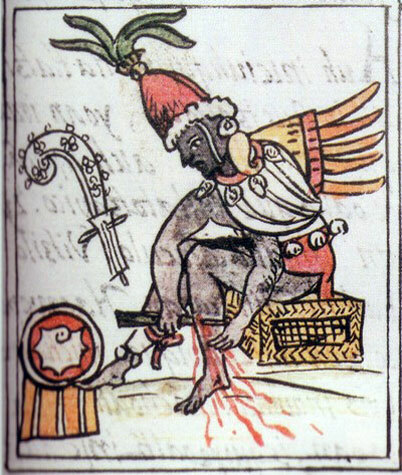 Accordingly, his end is also regarded as a consequence of the violation of his self-imposed rules to which he had been seduced by hostile deities ( Tezcatlipoca ). For shame he was pulled away. In Tollan followed him after reconstruction according to the reports as ruler Matlacxochitl and three other unknown ruler until with Huemac ( the son of the ruler of Totepeuh Colhuacan ) the dynasty came to an end in terrible sign. The Maya of Yucatán to the north a deity Kukulkan was worshiped, whose name is the same meaning as Quetzalcoatl. 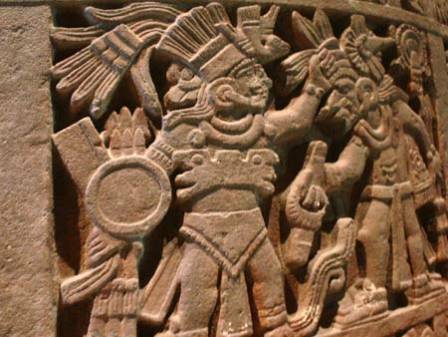 A leader of this name should be (after Diego de Landa's report) came from the west to the Itza, the city founded Mayapán be ruled there and then returned to central Mexico, where it is equated with the historical Quetzalcoatl. Kukulkan plays in the historical reconstruction of a Toltec immigration in Yucatán by several modern authors an important role. 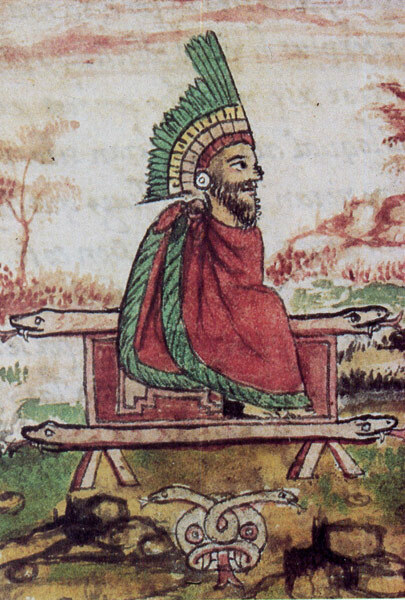 In colonial times texts, particularly of Franciscan authors, it is claimed that Moctezuma had initially held the Spaniards and their leader Hernán Cortés for the recurring Quetzalcoatl. So did the clever to the just landed Spanish legation against Cortés made ​​( according to Sahagún recorded in Nahuatl texts that can not come from eyewitnesses ) all Indian sign of homage, worshiped him and then said to him: "It can hear the God it greets him his vassal Motecuzoma who rules the city of Mexico. " You could have designed before him four different gods costumes to determine what he would wear to identify themselves by it. 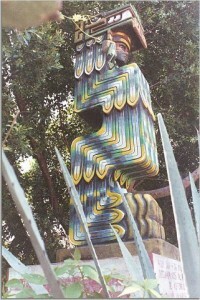 Cortés had decided on the costume of Quetzalcoatl. Cortés reported the Spanish king that Moctezuma would have referred to him only as a governor of a ( unnamed ) former ruler, whose coming back he would have expected and would now be entered with Cortés, so he put his power into his hands. With such act Cortés would have been for the king an indispensable mediator in the rule acquisition, what Cortés had to have every interest after the previous disobedience. The history of the Aztec awaiting the return of Quetzalcoatl was, after the Conquista is text that the later, more and more expanded. 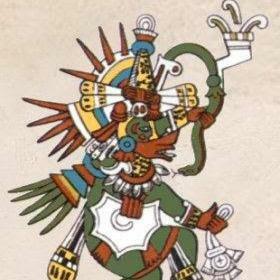 This idea came to meet, that the year 1519 in the Aztec year count one years one was acatl, so match the name of Quetzalcoatl, with name of calendar data in general (of which formally indistinguishable ) correspond to a day and not one year. The generally accepted professional opinion summed Nigel Davies: "It is now established beyond doubt that the story of a bearded, white-skinned Quetzalcoatl in its entirety is a colonial invention temporal ". This reinterpretation of the history of the Spanish conquest is not the only one.